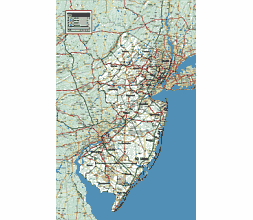 Editable royalty-free map of New Jersey, NJ in vector-graphic online store. 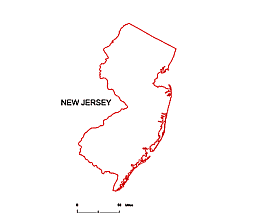 New Jersey is a state in the Northeastern and Middle Atlantic regions of the United States and it is bordered to the north by New York State, to the east by the Atlantic Ocean, to the south by Delaware (across Delaware) Bay| and to the west by Pennsylvania,(across the Delaware River). 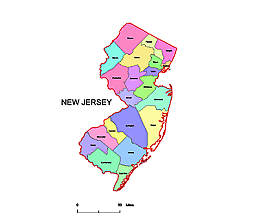 New Jersey county map, colored. 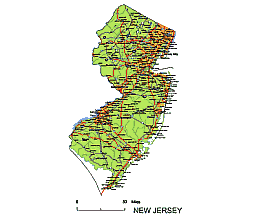 New Jersey State vector road map. 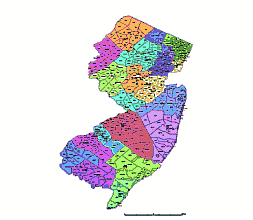 Vector county map of New Jersey. 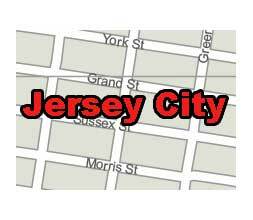 Jersey City NJ vector street map. CS5 version. 4 MB. The state is 166 mi (267 km) long from north to south and the greatest width is 65 mi (104 km) east to west. 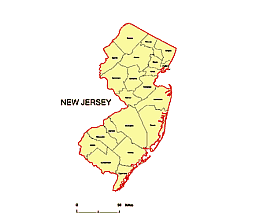 These dimensions result in a wide variety of weather, but overall, New Jersey has a moderate climate, with cold winters and hot summers; temperatures reach at times over 100 degrees F (38 degrees C) in the summer, and drop on occasions to around 0 degrees F (-18 degrees C) in the winter. In 1524, Giovanni da Verrazano was reportedly the first to visit the New Jersey coast. In 1609, Henry Hudson and his crew landed in New Jersey and explored the undiscovered land. The Dutch West India Company was chartered in 1621, and these merchants created settlements in New York and New Jersey.